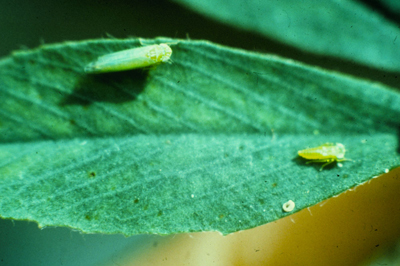 Potato leafhoppers have the potential to hurt alfalfa in Nebraska every year. This is generally a second and third cutting pest and has been common in Nebraska recently. Southerly winds bring this insect into Nebraska, as is does not overwinter here. There have been a lot of strong southerly winds the last couple of weeks, so it is likely that we have potato leafhoppers in the state. Producers are urged to begin scouting. These small (1/8 inch long), bright green, wedge shaped insects (Figure 1) may cause severe damage to alfalfa by injecting a toxin into the plant as they feed. This feeding results in a distinctive yellow or purple triangle shape at the tip of the leaf. First year spring-planted alfalfa fields are particularly attractive to and vulnerable to potato leafhoppers, as are fields planted last year. In older fields, these insects are usually a problem on second and third cuttings. Newly developed resistant varieties will protect from potato leafhoppers fairly well, but alfalfa in the seedling stage may still be damaged. All fields should still be scouted, as large numbers of leafhoppers may still cause a problem, even in resistant variety fields. Treatment decisions are based on numbers captured by sweep net. A sweep net is the only reliable way to scout for potato leafhoppers. See Tables 1-3 for decision-making help. Note that you don't need a lot of leafhoppers to cause a problem. Many insecticides are registered for control, and all with provide good results when applied properly. If possible, refer to the UNL Department of Entomology Web site at http://entomology.unl.edu/instabls/ for a list of suggested insecticides. Table 1. Dynamic treatment thresholds for potato leafhoppers (average number per sweep) on alfalfa that is 1 to 4 inches tall. Table 2. Dynamic treatment thresholds for potato leafhoppers (average number per sweep) on alfalfa that is 4 to 8 inches tall. Table 3. Dynamic treatment thresholds for potato leafhoppers (average number per sweep) on alfalfa that is 8 to 12 inches tall.